Although I loved the cypress swamps of my youth, we knew after 10 years of acclimation to Alaska temperatures that we would not be comfortable in the eastern part of NC due to the summer heat and humidity. We decided to look at land in the relatively cool mountains of Virginia and North Carolina. The search began in May of 1995. Stacy stayed in Alaska with the girls and I headed to NC for a 2 week road trip through the mountains. My father, then 80, still loved to roam the woods with me. 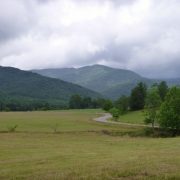 We headed out in his old Buick station wagon for northwestern Virginia and worked our way southwest through the mountains, stopping at likely looking parcels we found in the local newspapers we picked up in the small towns along the way. 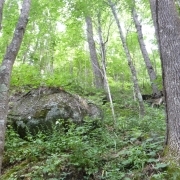 After looking at numerous properties along the way, we found a tract in Yancey County, NC. Although the lower portions of the property had been logged the year before, we decided to check it out. We were concerned about the steepness of the approach road to the land and were not optimistic until we rounded the ridge into the valley of the watershed. We headed up the logging road through the logged area and stopped for our first drink from the stream. Pop was hoofing along very well and obviously enjoyed Robert’s encyclopedic outdoor knowledge. 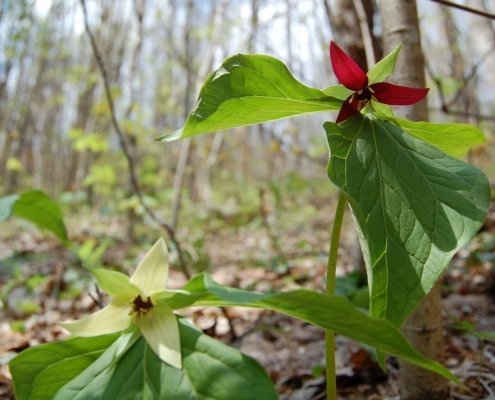 There were large white, pink, and burgundy trilliums everywhere. We also saw a variety of other wildflowers including 3 different violets, showy orchis, turk’s cap lilies (not yet blooming), and Frazier magnolia trees. 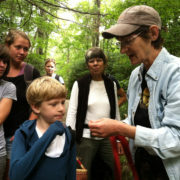 Robert also introduced us to the flavor of ramps, which grew in abundance among the trilliums and violets. I was delighted by the huge size of the Dutchman’s pipe vines that climbed the trees. We were very impressed with the richness of the soil and the variety of herbaceous species. Many of the trees were still bare of leaves, others were just beginning to leaf out. Recollecting the absence of sizeable trees that were purportedly present on the first piece of land we examined in Virginia, I insisted that we climb out of the logged area so that I could see the trees. And climb we did. Pop stayed at the base of the steep ridge as Robert and I climbed. Up on the ridge we found the northern red oaks, cherries, black and yellow birches, ashes and sugar maples that were of the size I had hoped to see. We climbed until I had enough… not to mention that our daylight was quickly running out. We heard songs of towhees, Carolina wrens, black-throated green (and blue) warblers, chestnut-sided warblers, and rose-breasted grosbeaks just to mention a few. We drove back to Weaverville feeling very excited. By now, I knew this property was special. Stacy and I had several long conversations on the phone about the feasibility of purchasing this land and, at the expense of years of vacations and other non-essentials, we managed to buy the land that we had dreamed of. 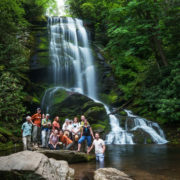 Thus, the first step towards our goal of protecting forestland was achieved. Now, we had to ensure that the land would be protected beyond our lifetimes for future generations. 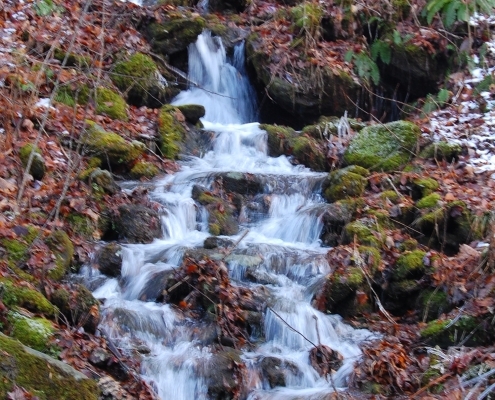 A conservation easement seemed to be the best way to accomplish our long-term goal. 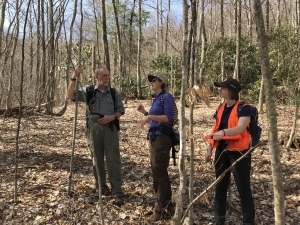 Landowner Russ Oates (left) discusses the property with Margot Wallston of Hemlock Restoration Initiative (center) and SAHC Stewardship & Volunteer AmeriCorps member Cate Jaffe (right). 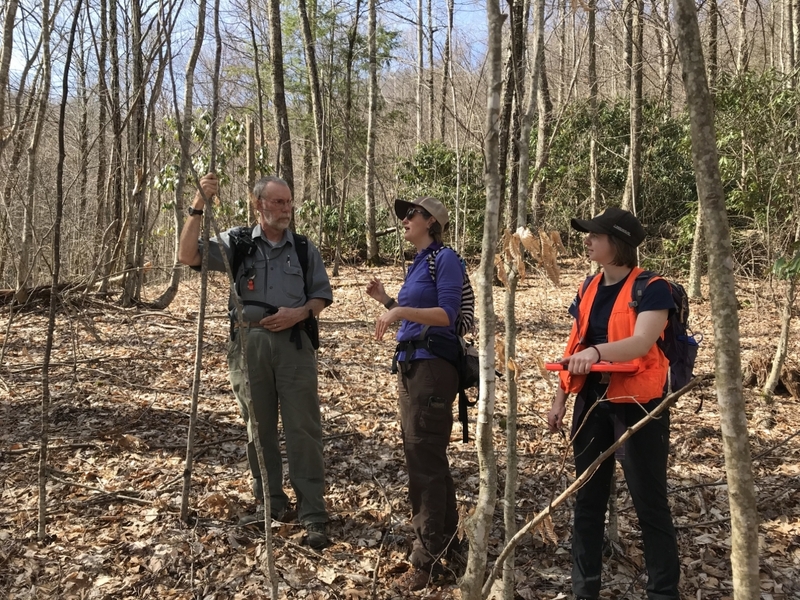 We contacted the Southern Appalachian Highlands Conservancy to learn more about conservation easements and to see if they would be interested in protecting our property. 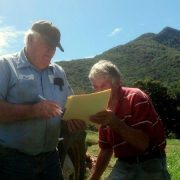 After several discussions, it was clear to us that a conservation easement was just what we were looking for. The folks at SAHC seemed excited about our land, and their Conservation Director, Michelle Pugliese, walked the property to assess its condition and determine if it possessed adequate conservation values to merit an easement. It passed the test and we have been so happy with their continuing interest and stewardship. Over the years, I have gotten to know several of the folks at SAHC and really appreciate their deep commitment to conservation. We strongly support their dedication, and decided to become monthly donors because it is a very convenient way to contribute to this important mission.